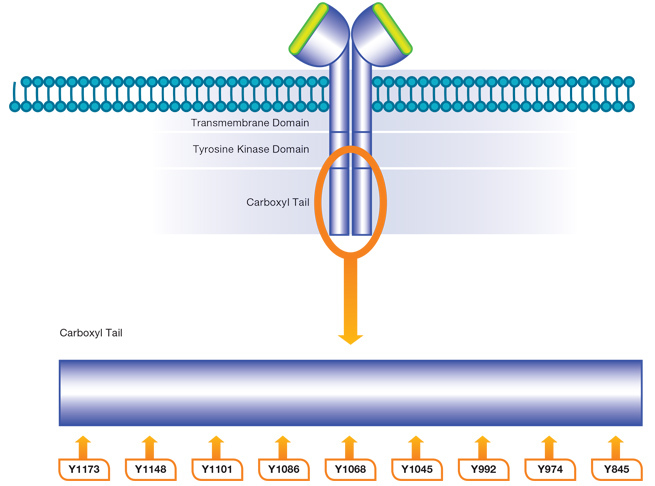 The epidermal growth factor receptor (EGF R), also known ERBB1 or HER1, is the most extensively studied receptor tyrosine kinase with approximately 70,000 publications. However, such is the complexity of its behaviour that it still requires further investigation. EGF R is one of four members of a family of receptors. The other members of this family are ERBB2/HER2, ERBB3/HER3 and ERBB4/HER4. EGF R is a transmembrane receptor consisting of a large extracellular region, a single transmembrane domain and an intracellular region. The extracellular region is approximately 620 amino acids in length and can be subdivided into four domains. Domains 1 and 3 are responsible for ligand binding while domain 2 and 4 are involved in receptor dimerization. The intracellular section of EGF R contains a kinase domain and a cytoplasmic tail. EGF R, when produced at the ribosome, is 1,210 amino acids in length and undergoes cleavage of the first 24 amino acids reducing its length to 1,186 amino acids. Numbering of amino acid residues is most often based on the cleaved protein however some organisations use the full protein when numbering amino acids. Seven ligands, listed in Table 1, bind to and activate EGF R. The seven ligands are epidermal growth factor (EGF), transforming growth factor alpha (TGF-α), heparin-binding EGF-like growth factor (HB-EGF), betacellulin, amphiregulin, epiregulin and epigen (Singh et al. 2016). All EGF R ligands are produced in a precursor transmembrane form which undergoes cleavage to release the extracellular soluble ligand. This cleavage is typically performed by members of the ADAM family of proteases. Once in the extracellular space, the EGF R ligands are free to bind to the available receptors. 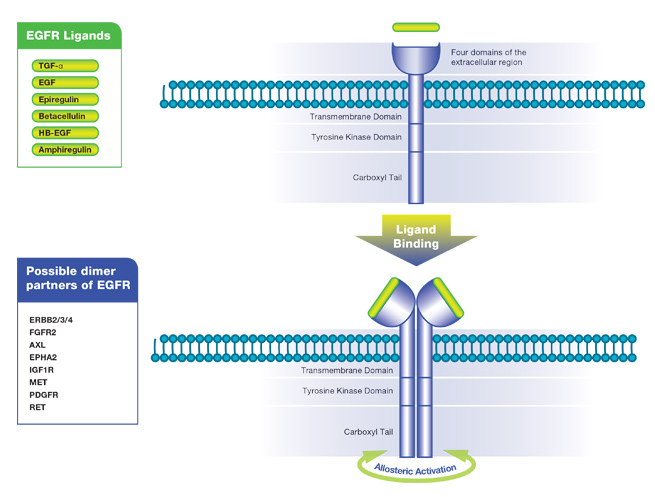 Ligand binding causes a conformational change in the four extracellular domains of EGF R and leads to dimerization of the receptor as shown simplistically in Figure 1. Dimerization of the extracellular domains brings the kinase domains of the two receptors closer allowing interaction between them. They then become allosterically activated following formation of the asymmetric dimer. For more detailed information on receptor Dimerization of the extracellular domains brings the kinase domains of the two receptors closer allowing interaction between them. They then become allosterically activated following formation of the asymmetric dimer. For more detailed information on receptor dimerization see Kennedy et al. (2016) and Lemmon et al. (2014). Fig. 1. Ligand binding induces receptor dimerization. Dimerization results in significant rearrangement of the extracellular domains as well as an interaction between the cytoplasmic domains leading to kinase activation. Dimerization results in significant rearrangement of the extracellular domains as well as an interaction between the cytoplasmic domains leading to kinase activation. Table 1. EGF R ligands, affinity for EGF R and other receptors for the EGF R ligands. EGF R activates several signaling cascades. Ligand binding induces receptor homo- and/or heterodimerization and autophosphorylation on key cytoplasmic residues listed in Figure 2 and Table 2. The phosphorylated receptor recruits adapter proteins such as GRB2 which activate downstream signaling cascades including RAS-RAF-MEK-ERK, PI3 kinase-AKT, PLC gamma-PKC and STAT. Fig. 2. Phosphorylation of EGF R. Ligand binding induces the EGF R to dimerize with another receptor. This leads to allosteric activation of the kinase domain and phosphorylation of several cytoplasmic residues. Phosphorylation of these residues can activate several signaling cascades. Table 2. Phosphorylation sites on the cytoplasmic domains of EGF R and their associated signaling pathways. Mutations in the EGF R have been associated with a number of cancers, including non-small-cell lung cancer (Sharma et al. 2007) and glioblastoma (Padfield et al. 2015). These somatic mutations involving EGF R lead to its constant activation, which produces uncontrolled cell division. The identification of EGF R as an oncogene has led to the development of therapeutic EGF R inhibitors including panitumumab, gefitinib, erlotinib, afatinib, brigatinib, icotinib and cetuximab. Cetuximab and panitumumab are examples of monoclonal antibody inhibitors. The monoclonal antibodies block the extracellular ligand binding domain. With the binding site blocked, signal molecules can no longer attach there and activate the tyrosine kinase preventing the pro-survival and proliferative effects of EGF R.
Kennedy SP et al. (2016). The Under-Appreciated Promiscuity of the Epidermal Growth Factor Receptor Family. Frontiers in Cell and Developmental Biology. 4:88. Lemmon MA et al. (2014). The EGF R Family: Not So Prototypical Receptor Tyrosine Kinases. Cold Spring Harbor Perspectives in Biology. 6(4):a020768. Singh B et al. (2016). EGFReceptor ligands: recent advances. F1000Research. 5:F1000 Faculty Rev-2270. Sharma SV et al. (2007). Epidermal growth factor receptor mutations in lung cancer. Nature Reviews Cancer 7, 169-181. Padfield E et al. (2015). Current Therapeutic Advances Targeting EGF R and EGFRvIII in Glioblastoma. Frontiers in Oncology. 5:5.